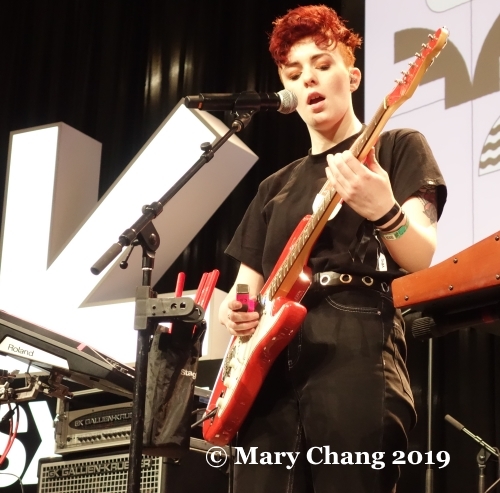 An often criminally overlooked part of SXSW are the Radio Day and International Day stages on the 4th floor of the convention center. 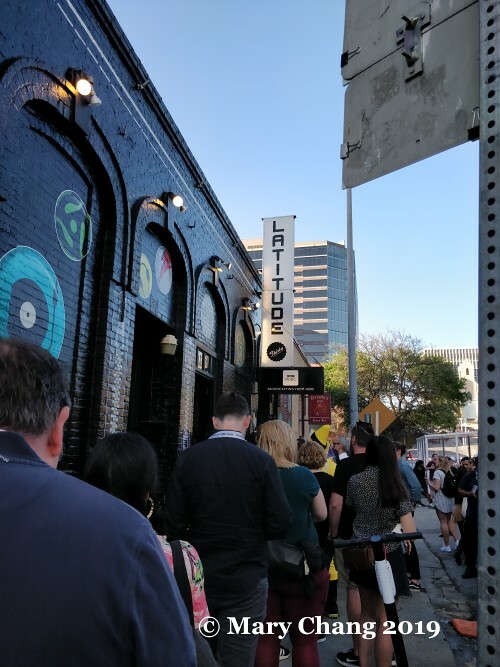 If you have ever attended SXSW as a badge-carrying delegate, I am sure you have walked by these rooms and never considered stopping to catch any of the bands. There was no contest which band on these stages had the most fan turnout on these two stage. That award goes to ‘90s giants Broken Social Scene, who appeared Friday afternoon and had a queue of fans going down the length of the convention center long before they even took the stage – I implore you to stop by in future iterations of SXSW to catch up-and-coming talent. 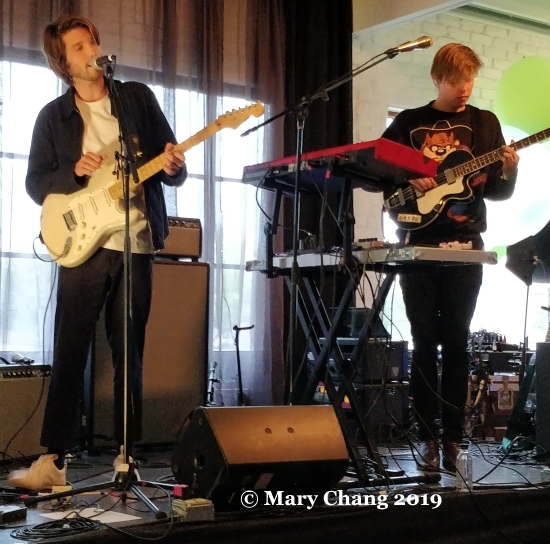 Two of the Bands to Watch I previewed before heading to Austin had prominent slots on the International Day stage, which in theory freed me up from trying to see them in the crush at the British Music Embassy at Latitude 30 later in the week. (You’ll see how that panned out later.) 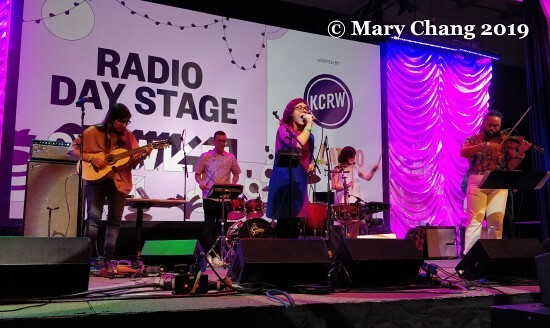 First, though, I found myself with some free time and a free Coke from the press lounge, so I ducked in to see Balún gracing the KCRW and NPR-sponsored Alt Latino showcase at the Radio Day stage. They are based in Brooklyn (insert your favourite indie band joke about Brooklyn here) but are originally from San Juan, Puerto Rico. They were the perfect pick-me-up to jolt me into life after my 4 AM wake-up call. The glasses-wearing, synth-driven indie group with unusual-to-rock instruments such as accordion and violin have managed to successfully marry the digital age with their Caribbean roots. ‘Prisma Tropical’, their second studio album released late last year, is Balún’s expression of their self-described dreambow genre. Rhythmically unmistakeably Latino and with frontwoman Angélica Negrón’s ethereal vocals, this is a group doing the Latin American diaspora in America proud and making music that keeps them connected to the country they felt they had to leave in order to access different opportunities. Following Balún, it was a quick mosey to the International Day stage where Elder Island were just setting up. 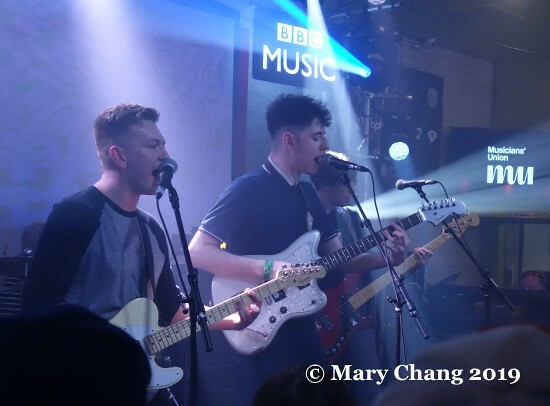 The Bristolian trio are part of the proud current wave of emerging artists keen on pushing the envelope beyond the traditional genres of independent music. 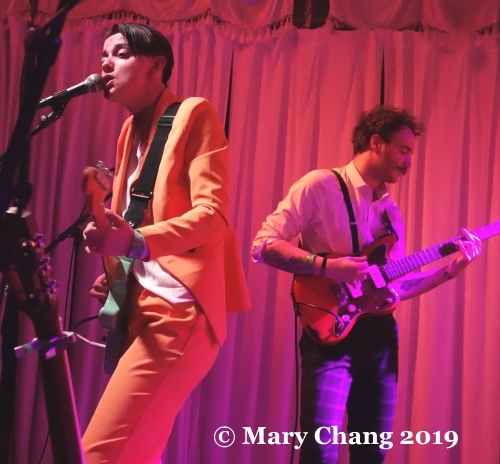 Their debut album, the self-released ‘The Omnitone Sound’, came out last month, a beguiling mix of Katy Sargent’s r&b-inflected lead vocals and cello, guitars, synths and beats probably best exemplified by the driving ‘You and I’. 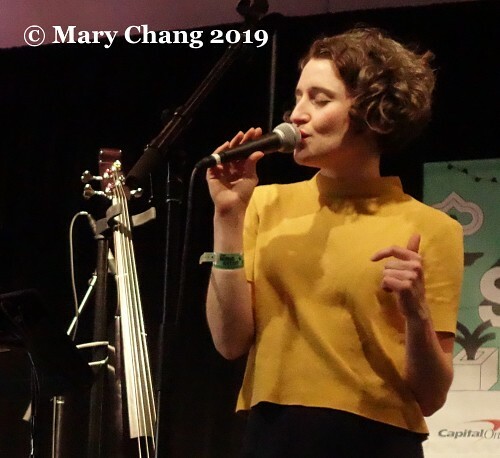 2 PM might not be ideal for a show more appropriate for a dark club filled with bodies bumping, but Elder Island did a great job in bringing that feeling to the room, eliciting more than a few instances of chair-dancing. You can read my past Bands to Watch feature through this link. Their efforts appear to have paid off. On a 25 degree C spring day that might have led some Texans astray after the awful winter they had, locals and industry jam-packed Latitude 30 to welcome them. ‘Self Proclaimed Council Punk’ isn’t just an EP title, it’s a state of mind. 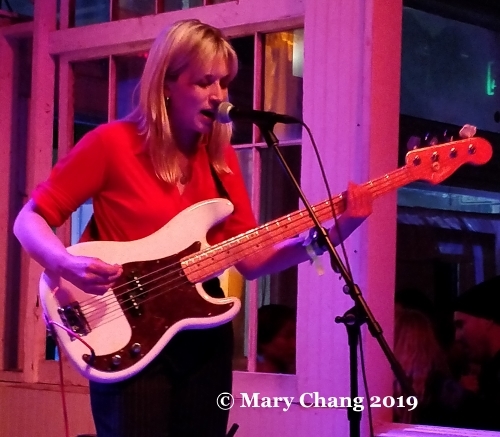 None of their songs overstay their welcome: the intent appears to be to play loud and fast, with barely a breath in between for themsevles or whoever is watching them. This is not music for the faint-hearted. The feeling of two fingers’ immediacy is inescapable. No matter how old you are, you will leave a Dunts gig feeling more alive than you have in a long time. I spent a brief interlude down on Rainey Street to check out some of the craziness during daylight hours. 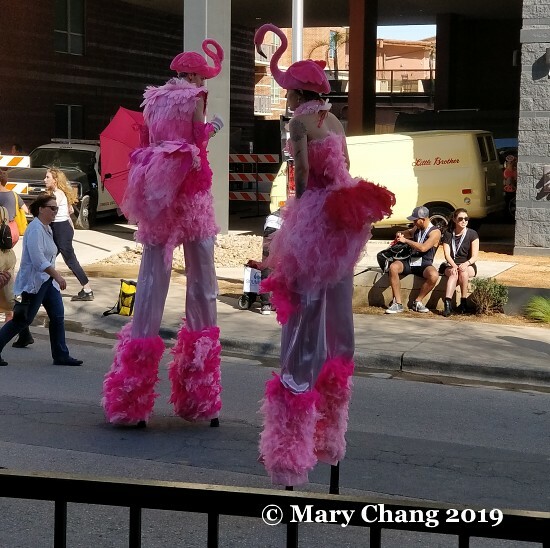 The armadillo-mobile was out again as last year but had to share the streets with a couple on stilts dressed like flamingoes. I like pink, but you’re never gonna get me to wear a pink bird on my head. Clive Bar was turned into a temporary carnival sponsored by Showtime, with a balloon artist, photo booth and popcorn and cotton candy vendor. Walking back into the centre of town with a large tuft of delicious, s’mores-flavoured cotton candy in hand felt like winning. I returned, making the mistake that I could just walk in for the Joy Formidable’s set at the British Music Embassy. Whoops. Really, though, my job is done when a band I’ve written about a lot has filled a venue to heaving, right? 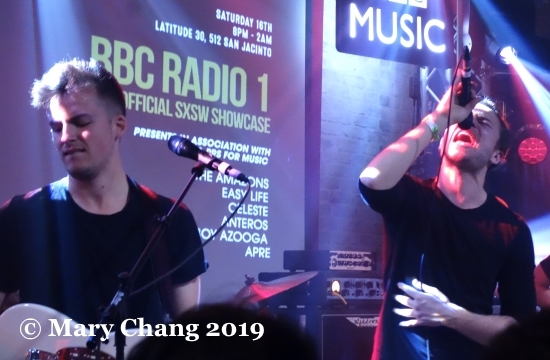 As is usual with Latitude 30 during SXSW, the windows were flung open, affording us poor souls who couldn’t get in the opportunity to hear ‘The Greatest Light is the Greatest Shade’ even if we couldn’t be in the same room with them. Hearing the final track of ‘The Big Roar’ reminds me of a time in my life when I got my heart broken. This song was my salvation, telling me with absolute certainty that one day I’d stop wanting to kick the guy and instead wish him well with the rest of his life with the woman he eventually chose over me. As the Welsh band’s wall of sound reverberated far beyond the confines of Latitude 30, I felt happy how far I’ve come to that moment and thankful I had friends who got me out of that dark place. To set myself up for a night of running around the city to be preceded by drinks with the Focus Wales crew, I decided to get dinner at Stella San Jac. The restaurant attached to the Westin has become a firm favourite of mine for food and drink while in Austin. At the bar, I ordered what now will probably be my usual there, the fried avocado salad. Don’t knock it until you try it. I was expecting a low-profile supper, served by some very cute bartenders. What I didn’t expect was being sat next to a man drinking a bartender-recommended tipple. He looked familiar but in an effort to play it cool in case it wasn’t who I thought it was, I tapped him on the shoulder and asked sotto voce. 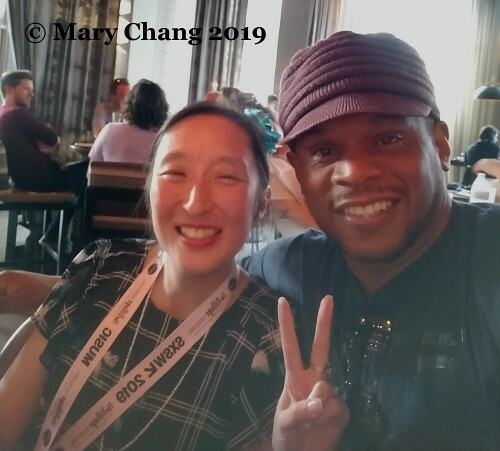 What ensued was a delightfully impromptu conversation about social media with the uber cool Sway Calloway, who I first came across as a hip-hop correspondent on MTV nearly 2 decades ago. Nowadays, Sway is the coolest of the cool cats, taking his own background as a rapper and radio experience and continuing to be a force of pop culture on his Sirius XM radio show Sway in the Morning. The verdict of our conversation? Neither of us will ever be as great with social media as kids are, but that’s okay. I was reminded of Lance Bass’ talk earlier that day where he talked about the importance of being authentic. If a old fogey like me being old school is wrong, then I don’t want to be right!